Samsung Captivate on at&t running custom Cognition 4.1.1 ROM. The standard disclaimers apply here: follow these instructions at your own risk. This may void your warranty. Discontinue use if a rash develops. After turning on “USB debugging” connect the device to your Mac using the USB cable. Once that’s done, click “OK” which should bring you back to the previous screen. Next, click the “Apply” button to save all these settings. 3.4 Mbit/s down, and 330 Kbit/s up on a 400ms ping isn’t fantastic, but it’s more than adequate for getting work done while out and about. I hope you’ve found this guide useful and are happily tethered now. If you have any questions or comments, feel free to share them in the comments below! Added on 2012-11-20: A reader named Art emailed me about HoRNDIS: a USB tethering driver for MacOS X. This may be useful for folks who are still interested in USB tethering on OSX. This is “high speed” EDGE? I might be able to, if someone would provide me with the HTC w/ T-mo service to test with… I don’t know anyone nearby who uses T-mo, so I can’t really help, otherwise. im running a mac os X 10.5.8 and have the samsung android galaxy prevail through boost mobile, i can use pdanet on my pc, but can’t seem to tether my phone right on my mac, the desktop pdanet app just freezes when i click connect to phone, would i be able to enter in the same account and pw that you did? If you can find the relevant settings for Boost Mobile, the same overall process I listed above should work. Why does this work using these configuration data and no other? Domain cingulargprs.com redirects to cingularchoice.com which is an “empty” domain. Antonio: It works because these are the relevant settings for the carrier — today’s AT&T Mobility is actually the old Cingular, which acquired AT&T Wireless in 2004. 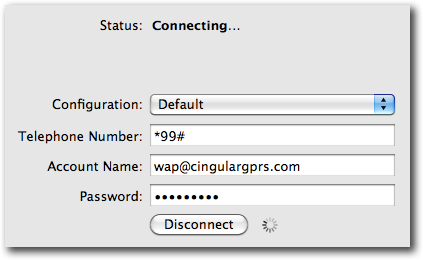 Cingular’s GPRS data network settings still remain in place today. 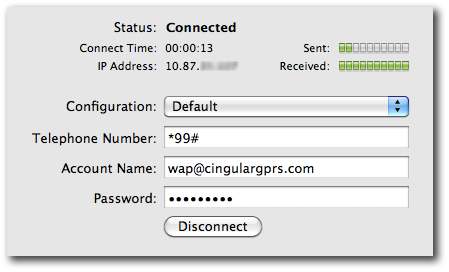 The actual domain name is irrelevant, as far as the telecom equipment is concerned, the account name (i.e., “wap@cingulargprs.com”) is just a string that happens to look like an email address, but could have easily been “internet” or “this is sparta!” if that’s what the Cingular telecom engineers decided to configure their equipment with in the beginning. hi from Australia. Great post, I just got my Galaxy Android connected to Mac OS X 10, works like a charm. absolutely great guide you wrote here. You made my day as I was looking for a possibility to establish the mobile connection to the APN from the end device so the IP address terminates there directly. 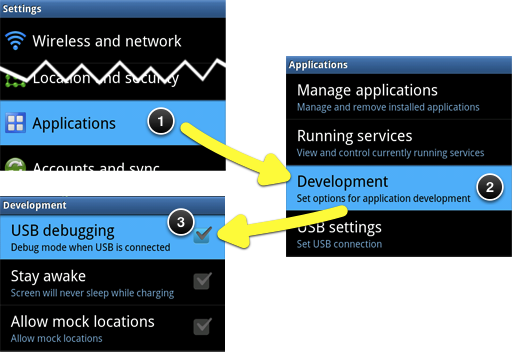 I would have never had the idea to enable the USB debug mode on my Samsung Galaxy S2 for doing this. Normally, nowadays’ cellular phones seem to prefer a mode which let them act more like a NAT-router instead of a simple modem as it used to be when I compare it to old Nokia phones. Some applications need to be reached directly and since few operators give you official IP addresses (T-Mobile Germany for instance using the “right” APN) without internal NAT, it’s great to have this possibility now without having to switch the SIM just to be able to do a VNC-session for instance. You made my day, many thanks and greetings from Germany! Yoshi, I’m so glad you found it useful! Thanks for letting me know — and sharing your great story about what you’re doing with it. Awesome guide, works really well. 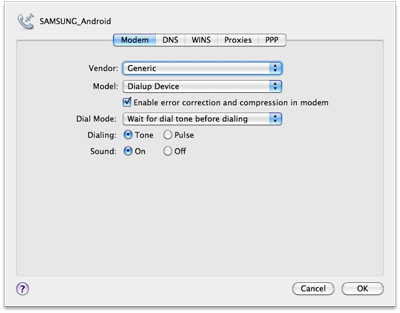 Question for the galaxy S II having HSPDA+ modem, does the GPRS include the HSPDA+ connection settings or does only have instructions for 3G connection? Thanks! Have you looked in “Network Preferences” yet? Is the “SAMSUNG_Android” device already registered there? If so, just configure the entry that was already created by you connecting your phone to your Mac via USB in the past. Hi, yes I did look in the prefs but the device doesn’t show up. In the end I installed PdaNet, and using it right now. It works perfectly. Every time I try to connect, it says… An error occurred with the modem. Try reconnecting. If the problem continues, verify your setting and contact your administrator. Unfortunately, I have no experience with the Samsung Admire — maybe someone else will chime in with an answer. My Samsung Infuse does the same thing. Did you find a resolution? Thanks, you saved may marriage! 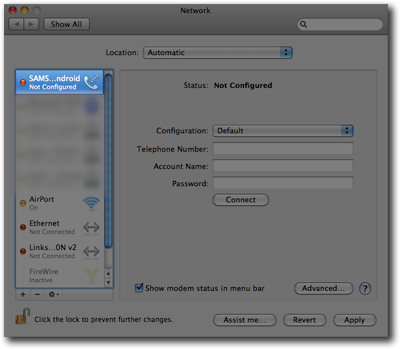 For unknown reasons, our Mac at home does’t connect to WLANs, so I use my 3GS Iphone via Bluetooth tethering to get an internet connection. Unfortunately, my wife insisted on having a Samsung Android phone. Despite considerable efforts, I failed to establish Bluetooth or USB tethering on the Mac, so she was dependent on my iPhone and had no chance to get an internet connection when I was away. Believe me, she was far from being amused in this situation. Last night I followed your instructions (without understanding what I was doing) and got connected immediately. It works without activating USB tethering, so it’s a mystery for me. Anyway, thank you so much for you tremendously helpful advice! Thanks, Bernd, for taking the time to share your story! It’s stories like yours that make this so enjoyable for me. Cheers! Dossy, thanks to you for a great guide! I’ve got a Samsung Galaxy Note switching from iPhone 4 recently. It was a bit daunting to start trying tethering with my macbook pro as the instruction in the user manual simply didn’t work (by turning on USB tethering under Settings). Your guide came to rescue, and it is much appreciated. I’m using Telstra in Australia, and here are 2 minor points to add 1) on Mac, I leave the the account name & password blank 2) it will automatically disconnect whenever the screen times out on my phone; so I had to set the longest timeout value (10min) and touch the screen on my phone every so often to keep it alive. That’s great to hear, Jerry! Thanks for sharing your experience. I’m sure other Telstra users will find it helpful when they find this page! I use Galaxy Notes but always get “Network Connection. An error occurred with the modem. Try reconnecting. If the problem continues, verify your settings and contact your administrator” Can anyone help? Hi Dossy, I’m trying to tether my Motorola Defy running on CM7 to my 10.7.2 Mac but for some reason whenever I plug my phone into the computer it doesn’t tell me that a new interface has been detected so I try to go to System Preferences/Network anyway but my phone is not showing up on the left side where it should be. I was able to setup tethering using my Blackberry, but my android phone is giving me a hard time. Also, whenever I plug my phone it gives me 3 options. Did you turn USB debugging on, like I described above? If your phone is prompting you as you describe when you connect it, then my guess is you haven’t done it, which is important. On the second minor point of auto disconnection upon screen timeout, I came to understand the reason, after accidentally noticing config under Settings – Location and security – Screen unlock settings, by clearing the “Disable USB debugging mode”, the auto disconnection issue went away, which makes sense. I’m using Samsung Galaxy Note, running Android 2.3.6. That’s great news, Adam. Thanks for sharing your experience and confirming it worked for you! Dowdy I have a DROIDX will these steps work even though you put different phone I have the information? ?? Dossy I posted other question didn’t proof it I asked if I have droidx will it work even though its different phone information its still an android system??? Unfortunately, I don’t know. No one else has confirmed that they got a DROID X working. Give it a try, and if it works, definitely let us all know! Unfortunately, this guide only applies to select Samsung Android devices. Samsung provided a custom USB network interface to provide compatibility with Mac OS X. The standard Android RNDIS USB tethering interface is not compatible with Mac OS X, as Apple refuses to support RNDIS, and no one else has written a generic RNDIS driver (Missing Sync came close for WinMo, but never finished it for other platforms). As such, your best bet is Wi-Fi tethering on non-Samsung Android devices. Even that is problematic… unfortunately. I have a SGS2 / iMac 10.6.8 and try your configuration. Everything is working excellent. Many thanks for your manual. An error occurred with the modem. Try reconnecting. If the problem continues, verify your setting and contact your Administrator. On Sprint, I believe the APN is “internet.com” and username and password blank. Same deal as the gentleman above (Sprint, Galaxy S2, OS 10.6.8). I tried to verify internet.com as the APN (everything looks good), but and I used the telephone *99#, but it is a no go. Do you know if anyone else has had more luck? I just replied to you, below – for Sprint, use the phone number “#777” instead. Hi, Dossy. Thank you very, very much for any help. I have Sprint and have used phone as #777, and internet.com for the APN. It was unable to connect. I am getting a “no phone service detected” error. Any thoughts? Thank you again. According to my Google searches, Optus prepaid APN should be “internet”. Hello from the future. I can’t get this to work on Sprint in the USA and I was hoping someone has worked up a solution. I confirmed that the APN is “internet.com”. Is telephone number different for Sprint? According to Google searches, for Sprint, use the phone number “#777”. I did everything, step by step, as listed above, 5 times. Still getting the same message about incorrect connection information. I’m in Australia, using Optus post paid, on Sam GS11 and trying to tether with iMac. i have a xperia neo v with android 4.0 and my mac do not recognize my phone…i tried everything, many apps, but nothing works. When i connect the usb, my mac tells me that is imposible to read and give me the options to ignore or eject. AND all this started after i did the actualization for the 4.0 android. DO you know something about this? A connection could not be established to the PPP server. Try reconnecting. If the problem continues, verify your settings and contact your Administrator. I’m using galaxy tab 2 and MACBOOK PRO OSX 10.7.3. That means the server you’re connecting to isn’t found, I believe. I’m in Canada with Bell and I used a blank username and password, with an APN of pda.bell.ca and it worked. You may need to find the APN settings for your network. Thanks so much for this! Works perfectly with my Galaxy S3 from AT&T. I have been using this a while and it doesn’t seem to be using up any of my data. Do I get unlimited internet with this? A connection coudl not be established to the PPP server. Try reconnecting. If the problem continues, verify your settings and contact your administrator. I am on OSX Lion and Galaxy s3 AT&T. Your settings and instructions are perfect. It dials out fine, but won’t connect. Any help would be appreciated. Can i get this work with my HTC One S? I have the samsung galaxy S3. but I am in Afghanistan as a contractor. I am using etisalat for 3G. any ideals. I just used your tip to connect my Galaxy S3 with OS X 10.8 and it worked flawlessly. I had similar configuration for a BlackBerry and Windows PC. So glad I can do the samewith my Androidhand Mac. I’m at a conference hotel and didn’t want to pay $15/day for Internet. Thank you! MacBook Pro and Galaxy Ace II Samsung. I’ve installed Android USB program and Kies – nothing works. I followed the instructions and all worked fine with Mountain Lion 10.8.2 and SAmsung Galaxy Mini 2. 3. The correct APN for the Carrier (again, check it!). 4. The username and password: this also depends on the Carrier. Some carriers, like for example TIM in Italy, do not authenticate the user via username and password but simply via the telephone number. In such a case, itis better to leave the fields blank! I just got my tethering working (Amaysim / Optus AUS) to my Samsung Galaxy S partly following the settings on this page so thanks very much Dossy for posting it here. You’re a lifesaver! Something I noticed is that you don’t need to enter anything in the phone number, username or password fields for it to work with Optus. All I entered was the APN “internet” and the modem settings you described and it connects. Am about to try this with a shiny new Sony xperia acro S (LT26w) across to a not so new PPC running 10.4.11 now a final piece of the puzzle was found here @ Dossy’s – well done everyone. Here I go…. I’m in the UK and use Three as my provider. I’ve got a Samsung Galaxy Mini and have found that doing nothing other than using *99# or *99***1# as the ‘Telephone Number’ and leaving the advanced settings as Generic/Dialup Device is enough. The other advanced options I leave as the defaults as well. Dossy, thanks for all your answers. I have one question. How can I get my mac running 10.5.8 to recognize my galaxy note. I’ve tried everything. When I connect it via usb, nothing happens. Please help. Thanks. It’s strange because I use this configuration with my Motorola Razr without problems, but it doesn’t work with the S4. Maybe it has to do with the vendor and model setting (which I believe determines the modem script) and I need to download a different script? Anyone have thoughts? 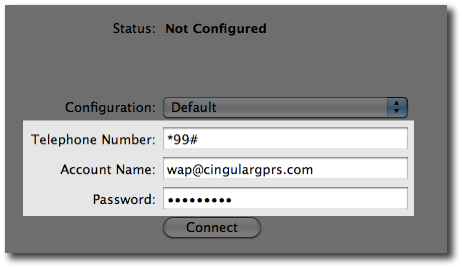 Also, based on AT&T’s website, WAP.CINGULAR and CINGULAR1 need to be in all caps, but based on my experience I don’t think it really matters. I just looked at the system logs. Seems apparent that this modem script isn’t working. It gets up to “initializing phone” but then says no response from modem. Anyone know where one might find the appropriate modem script for the Galaxy S4? Running AOLserver … on the iPhone? How young is too young … for WordCamp?